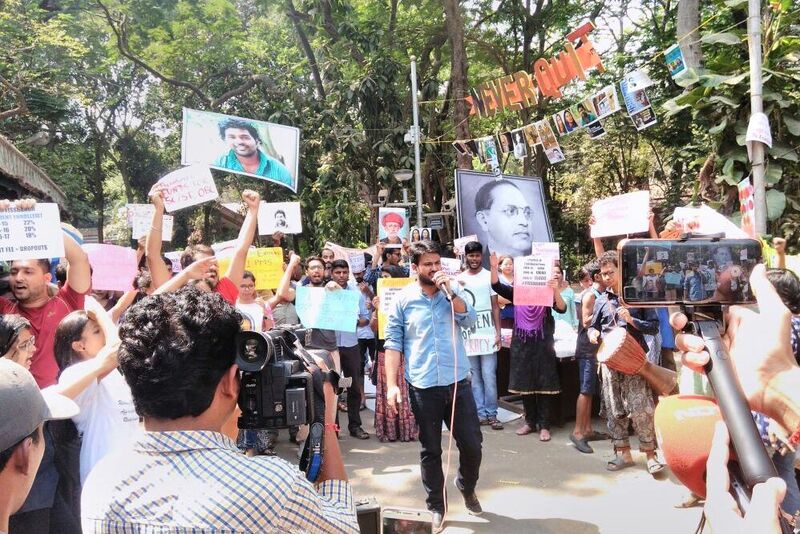 The ‘Chalo TISS’ call given by the General Body of TISS students was highly successful, with more than 500 people all across India along with 20 organisations participating in solidarity with the protesting students at TISS. The ‘Chalo TISS’ was a nationwide call given by the General Body as the strike entered Day 13. The ‘Chalo TISS’ call also included postcard campaign where thousands of letters by the participants of ‘Chalo TISS’ have been addressed to the MHRD, to intervene in the GoI post-matric scholarship issue at TISS. Even as the TISS strike entered Day 13, the TISS administration has not come out with any concrete and sustainable solution to resolve the GOI PMS issue, despite the students time and again brought in to the administration notice the high number of dropouts which the institute has witnessed since 2015, when the fee waiver was rolled back. Meanwhile, the student protests are still going strong. Different students groups in the institute including the Johar-Adivasi Students Forum, The North East Students Group, OBC students Forum, TISS Queer Collective, and Ambedkarite Students TISS have come up with strong statements in condemnation of the unilateral decision taken by few Union members saying that they will back off from the strike without consulting the General Body. The statements have also retaliated that the strike will continue till all demands, raised for the current and upcoming SC, ST OBC students are met of all the campuses. The ‘Chalo TISS’ call also saw TISS Alumni coming in solidarity with the protesting students as they collected more than 800 signatures, from Alumni to a strongly worded letter to the administration asking for a continuation of fee waiver. Additionally, students from Mumbai University, IIT Bombay and IIPS have also lent their support.